Χάρη στην ποιοτική διαμονή και την άριστη εξυπηρέτηση του Saxony Beach Hut, στην επίσκεψή σας σε Γκόα θα νιώσετε σαν στο σπίτι σας. Από εδώ, οι επισκέπτες μπορούν να έχουν άμεση πρόσβαση σε όλα όσα η πόλη έχει να προσφέρει. Με την βολική του τοποθεσία, το ξενοδοχείο προσφέρει εύκολη πρόσβαση στους προορισμούς της πόλης που πρέπει οπωσδήποτε να δείτε. Το Saxony Beach Hut προσφέρει επίσης πολλές εγκαταστάσεις για να εμπλουτίσετε την διαμονή σας στη Γκόα. Για την άνεση και την διευκόλυνση των πελατών, το ξενοδοχείο προσφέρει 24ωρη φύλαξη, παντοπωλείο, ημερήσιος καθαρισμός, τζάκι, ιδιωτικό τσεκ ιν/τσεκ άουτ. Τα δωμάτια του ξενοδοχείου έχουν διαμορφωθεί προσεκτικά ώστε να παρέχουν υψηλό επίπεδο άνεσης και την ευκολίας. Σε κάποια από τα δωμάτια, οι επισκέπτες μπορούν να βρουν πετσέτες, καθρέφτης, σύνδεση internet (ασύρματη), ασύρματη σύνδεση internet (δωρεάν), μπαλκόνι/αίθριο. Κατά τη διάρκεια της μέρας μπορείτε να απολαύσετε την χαλαρωτική ατμόσφαιρα των ενοικίαση εξοπλισμού θαλάσσιων σπορ, θαλάσσια αθλήματα (μη μηχανοκίνητα). Το Saxony Beach Hut είναι μια έξυπνη επιλογή για τους ταξιδιώτες στη Γκόα προσφέροντας κάθε φορά μια ήρεμη και ήσυχη διαμονή. Just your room on stilts, a few steps on white powdery sand and splash right into clean as glass ocean. It is just you and the beach - quiet and no distractions. In the evening the sunset is magnificent. 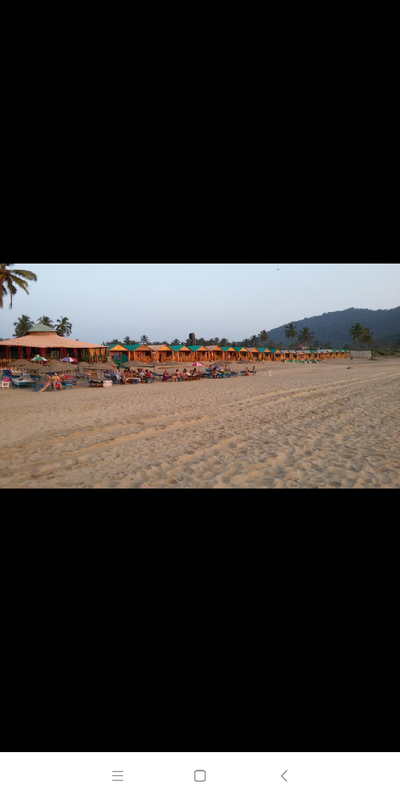 Spent the new years eve here, Goa being a chilled out place this place was 'slow' too as it was the holiday season. We enjoyed the location which is the only real thing going for this establishment. The food at the restaurant isn't that great. The room does not have a geyser or a simple mosquito repellent - The staff was either busy or lazy to provide us with one even after multiple requests. The rooms are not cleaned everyday. Pros Location Restaurant Bonfire... Candle light dinner Cons Cleanliness.. make sure you keep your hut clean . 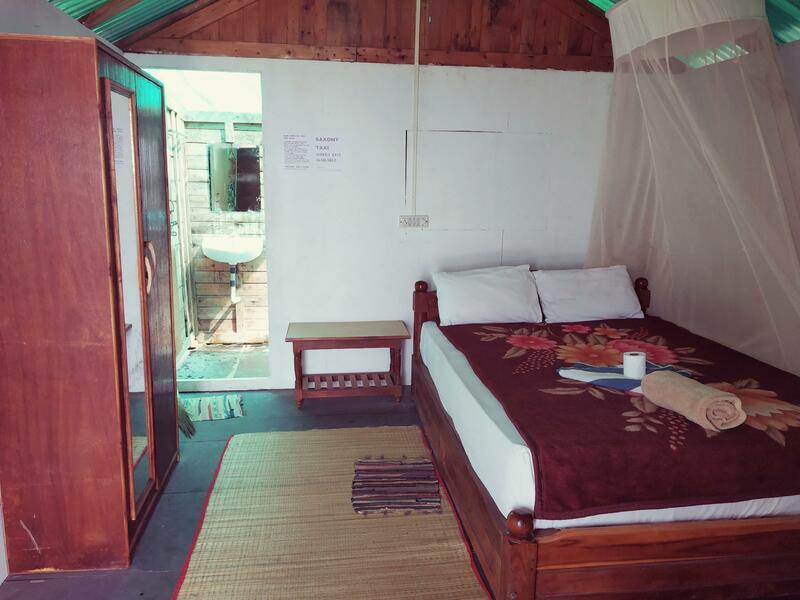 The room was completely opposite to the pictures in the website.... Bathroom didn't have any thick shade in the top so in the day time its very hot because of the direct sunlight.... The room was too dirty ..no room service provided.... No housekeeping evreyday to clean.... All the amenities were too old and in a very bad condition.......the restaurant food was too expensive as well as no taste when you compare it with near by other places. Dear customer i think you should read other reviews too, and the pictures we have given there is not fake please why do you say its completely opposite ??? No no you are totally not true coz i am here for last 11 years and we have many customers repeat ! If we are try to cheat them they would never come back , i am agree with top of bathroom that is not thick but many other property has even no top they are open please check with jojo lapa, the white sand , agonda cottage , h2o agonda and more.... And they are the most expensive property in agonda. So ??? And you wanted to have room service and we have explained you that we don't do coz after the food in room its a open aria so ants and mice follows the smell of food and gives you hard time. Another thing you have mentioned food in the restaurant is expensive it is not expansive your budget is low as i have experience here 11 years i have found this. Thank you. It was wonderful to be able to step onto the beach from bed each morning, and took watch the sunset every afternoon from the balcony. The facilities are really basic, so expect slightly better than camping. The walls and doors have big gaps so wildlife often find their way inside. You'll become good friends with spiders, frogs, lizards and rats. I would recommend staying no longer than a couple of days. If you like Agonda you can then move to better accomodation off the beach. This place is worth every penny. If you are planning to just stay there and roam around the beach and chill all day, then this is the place to be. the cleanliness is a little less, but for this cost I wouldn't complain. The perfect stay that I needed. Thank you very much dear guest for your valuable reviews and we hope to see you again. The beach huts were well maintained and scenic. But we had rats visit our hut at nights. Except that everything was just perfect. Even they have security for their guests at the beach till late at night. Bad. 1} No card 💳 payment they have machine but don't accept card payments to avoid tracking by income tax department. Always tell line is dead. There is only one atm 🏧 in agonda. You must take enough cash with you. Food is very costly for two surmai fish pieces they have charged 600. You have to call for room cleaning. Good: location is awesome. Beach is so beautiful that you will forget all bads. It is just like private beach. If you want to relax with no disturbance from outside world this is perfect place. A very basic hut with incredible views..Not worth the £40.00 a night we paid , but that's going thru booking agents lots of places for less than £15.00 a night for two available in Agonda with better facilities ! !All the same great staff and a great view !! Location is great, right on the beach (southern end of Agonda beach), quiet and peacefull. Restaraunt good but a bit more expencive compared to others on the beach. Can go to the sea right from your veranda - great! Room basic, no hot water. Had problem with mouse/rat running around the room and on my had (literally) several nights; staff's reaction was "it's OK because it's a beach hut, it comes included", refused to provide mouse poison/trap. Room a little runned down, beddings questioned. Cleanning on request. And the last but not least: this is the point of stop to day-tour of organised groops of russian tourists; so at noon two-three buses of them made disembarkation occupying the restaraunt, beach beds and everything till sunset with all that comes with them. Thanks a lot for your valuable views. All rooms have a great sea view front, it feels so good when you wake up to a sea view everymoring, nothing disturbs your stay expect those high tides making sound. Well, interms of activity, either you go for swim, surfing, or go for a barefoot run/walk, from one end to other end its approximately 2.4Km. I ran 10k everymoring during my 4 days stay at Saxony and experienced seashore barefoot run. Volleyball net was missing for enthusiastic, I hope Saxony will provide this facility. Well, Agonda beach is for those who are finding peacetime in the tranquility of sea shore be you single, with family, with spouse or friends. The good thing about this beach is very clean, Its less crowded unlike any other beach such as Anjana, vagator, Miramar, Aguada where water sport attracts huge visitors and makes it too commercial. There are few more resorts located on the beach side one can choose based on their budget. And I must say that food is very tasty and staff here are very friendly. The best place you can stay in South Goa. We loved Saxony. We had 2 huts side by side right on the beach. The sun does hit them in the afternoon but you can go to the coolness of the restaurant or swim to cool down. The food was good and Deep really looked after us. It had a very relaxed feel.